Probabilistic Foundations of Statistical Network Analysis presents a fresh and insightful perspective on the fundamental tenets and major challenges of modern network analysis. Its lucid exposition provides necessary background for understanding the essential ideas behind exchangeable and dynamic network models, network sampling, and network statistics such as sparsity and power law, all of which play a central role in contemporary data science and machine learning applications. The book rewards readers with a clear and intuitive understanding of the subtle interplay between basic principles of statistical inference, empirical properties of network data, and technical concepts from probability theory. Its mathematically rigorous, yet non-technical, exposition makes the book accessible to professional data scientists, statisticians, and computer scientists as well as practitioners and researchers in substantive fields. Newcomers and non-quantitative researchers will find its conceptual approach invaluable for developing intuition about technical ideas from statistics and probability, while experts and graduate students will find the book a handy reference for a wide range of new topics, including edge exchangeability, relative exchangeability, graphon and graphex models, and graph-valued Levy process and rewiring models for dynamic networks. The author’s incisive commentary supplements these core concepts, challenging the reader to push beyond the current limitations of this emerging discipline. With an approachable exposition and more than 50 open research problems and exercises with solutions, this book is ideal for advanced undergraduate and graduate students interested in modern network analysis, data science, machine learning, and statistics. Harry Crane is Associate Professor and Co-Director of the Graduate Program in Statistics and Biostatistics and an Associate Member of the Graduate Faculty in Philosophy at Rutgers University. Professor Crane’s research interests cover a range of mathematical and applied topics in network science, probability theory, statistical inference, and mathematical logic. In addition to his technical work on edge and relational exchangeability, relative exchangeability, and graph-valued Markov processes, Prof. Crane’s methods have been applied to domain-specific cybersecurity and counterterrorism problems at the Foreign Policy Research Institute and RAND’s Project AIR FORCE. 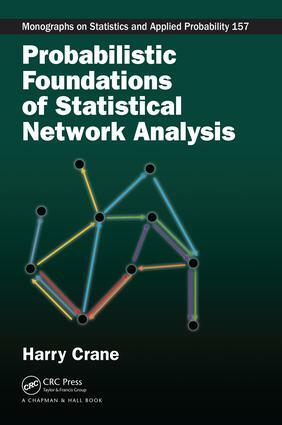 "I believe this book can serve both as a reference and textbook, but primarily should be seen as a textbook for a course built around foundational aspects of statistical modeling for network data. Most prior texts I am aware of focus on statistical methods within existing network models. I really like that this book helps the reader understand the statistical implications of choice of model, both in terms of "coherence" and sampling. Most prior work presents the field of statistical network analysis as a basket of models from which one chooses their preferred method. Crane takes a more foundational approach - showing how choice of model leads to implicit statistical assumptions that too often go unspoken." Is the Markov property a good assumption?